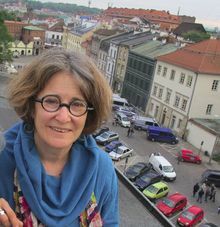 Ruth Ellen Gruber is an American writer, photographer, and public speaker long based in Europe who has chronicled Jewish cultural developments and other contemporary European Jewish issues for more than 20 years and currently coordinate the web site www.jewish-heritage-europe.eu. Ruth’s latest books are "National Geographic Jewish Heritage Travel: A Guide to Eastern Europe," published in 2007, and "Letters from Europe (and Elsewhere)," published in 2008. In 2015 Ruth was the Distinguished Visiting Chair in Jewish Studies at the College of Charleston, SC.